The Gospel of Jesus Christ is the only thing that changes people’s lives. Jesus told His disciples to reach the world with the Gospel. This has been the heartbeat of the Baptist Bible Fellowship. Start churches – reach people. David Janney and Ronnie Floyd spoke Tuesday evening at Baptist Bible College Fellowship Week 2015 about those two subjects. Two passionate messages that remind us all why God has us here. David Janney took his message from Matthew 16:16-18. There 200 million non-churched in America. The U.S. is the 4th largest population unreached people (behind India, China & Malaysia). 3,500 churches close doors permanently every year. 85% of all churches have plateaued or declining. Of the 15% that are growing, 85% are doing so by transfer growth. So only 3% are growing because of evangelism. People will go to new church before attending an old church. “It’s easier to give birth than raise the dead.” It’s not about how many churches in an area, but how many unreached in an area. America is a mission field. Churches that plant churches grow faster than those who don’t. This passage says 4 things about the church: I will build my church. 1. I… Jesus is the ‘I.” He is the rock that gives stability to lives and churches. 2. …will build.. God uses all kinds of people to build His church. He uses people who will come to Him. 3. …my… It’s all His. When you’re blessed, growing, and even struggling it’s His church. In my hand a church is just a group of people, but in Jesus’ hands it changes the world. It just depends on whose hands it’s in. 4. …church. Jesus doesn’t promise to build a school, fellowship, or social organization. Build a church and everything else works out. Ronnie Floyd took his message from Acts 1:8. Ronnie encouraged pastors to extend the call to the ministry every Sunday from the pulpit. When God gets hold of a tender heart, they are willing to risk it all. Risking it all is not about your location, but about your calling in your life and ministry. It’s not about the size of your church, but the size of your vision and faith. It’s about maximizing the calling of God in your life – what God wants you to do. We’ve got one shot in life. Are you willing to risk it all for Christ? In America, we can’t fix ourselves. We need a mighty awakening. Do you still have the heart to risk it all in your calling and your ministry to reach the world for Jesus Christ? 1. A personal decision. Jesus said, “But you..” Jesus made it personal. Salvation is personal – evangelism is personal. Remember the moment Jesus saved you. Remember the moment Jesus called you into the ministry. Risking it all is a personal decision. 2. A powerful experience. Wherever God calls you and whatever He calls you to do, He will give you the power to do it. There are moments when ministry is wonderful and some moments when it isn’t wonderful. It’s only by God’s supernatural power you are where you are. You gotta learn to the surf the seasons of ministry. Every church has seasons that aren’t easy. Remember, God can do more in a moment than you can ever do in a lifetime. Walk with God! You take care of the depth of your ministry and God will take care of the breadth of your ministry. Risking it all is a powerful experience. 3. A progressive vision. It consumed them. Jesus told them you will be witnesses (martyrs) in your community, in your country, and in your world. Today’s pastors must become missiologists and missional strategists. They need to know their community and the people. You gotta know who’s there to reach who’s there. Risking it all is a progressive vision. David Janney has been the pastor of Orlando Baptist Church since 1987. He is also founder and president of World Hope, an organization whose mission is to help people prepare eternally. Recently, World Hope launched The Hope Center in Detroit. 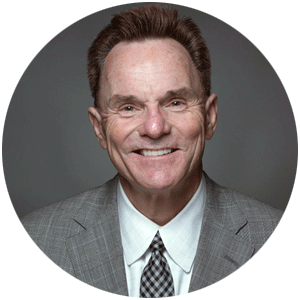 Ronnie Floyd has been the pastor of Cross Church in Northwest Arkansas since 1986. In 28 years of ministry in Arkansas, the church has baptized over 17,000 people. He is the current President of the Southern Baptist Convention.